thanks so much for your recent help on my purchase. All round good service. I've used them in the past and I will use them again. Excellent. I'm sure the batteries will be ideal for the purpose they were bought for. I bought the batteries for my late mother's mobility scooter that I was selling. I've had no complaints from the lady who bought the scooter. As for the customer service, I couldn't wish for better. I ordered the batteries on a Monday afternoon and they were delivered at 8.30 the next morning. Was very satisfied with price and service received. This turned out to be the perfect purchase. 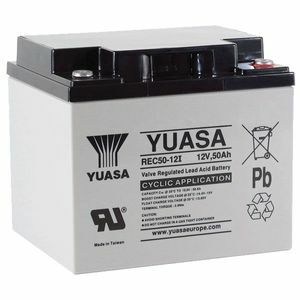 The Yuasa batteries are renowned for quality. and dealing with Tayna was a pleasure. Keen prices. and delivered faster ghan expected. Reliability and after care i cant vouch for. But if its anything like the website and purchase I'll have nothing to worry about. Thank you. Excellent service from start to finish. Delivered on time and in excellent condition. I would definitely recommend this company. Thank you to all at " Tayna". Works perfectly, timely delivery, excellent quality battery and excellent service. Excellent service, would definitely use Tayna batteries in the future. These batteries were purchased as replacements for 12V 45Ah ones and having similar dimensions. They were ordered and delivered within 24 hours. The old ones were removed and these just dropped into place without any problems. The scooters performance has been restored to as new and hopefully will continue to do so for many years. Excellent service by all concerned. A battery with a good reputation at a competitive price. They took two or three charges before they appeared to reach their expected capacity, but the scooter is now working like a new one.